Slowly, ever so slowly, I am trying and feeling I am returning back to normal life. Yes, with vacation, the before and the after, it always tend to get a little hectic and not much time for fun stuff. Like processing photos – in a realistic way or even better in an artistic way. Which I have missed for a while now (with my computer upgrade etc.). So, I found this monthly Friday, o.k. I am already a day late, hop displaying nothing but photo art. There are really some nice examples there and I urge you to check them out. This round’s optional theme is: Abstract flowers. Does that sound like me? Or does it sound like me. If you have been following my blog and know me a little, you know that both parts are right down my alley. And I love cubist style, so I keep on trying to replicate it with my own photos. Hence, I got to play in Photoshop this morning – woohoo! I had a lot of fun trying out different things to get the image just the way I wanted it. I hope you like it, but it is o.k. if you don’t, because, as we all know, art is very subjective. Unfortunately I am too late to participate in the link up, but it still gave me the much needed push to create. After a few weeks absence due to said vacation I will slowly start again to participate in one or the other blog hop. Because it is fun, I get to meet new (and old) people and it gets me writing and showing photos on my blog. Sounds like win win, right? So, the above is my contribution to Adrienne’s Six Word Friday and below Hilary’s Friday Four Fill ins (yep, another two I am a day late for) – oh well, so be it! 1) This week I had to still clean up at work from my Bonaire vacation. Why do we go on vacation if there is always so much to do when we return?! 3) Only the huge piles of snow and ice are still resisting the sun shining today so nicely. Thank you for leaving a comment at Photo Art Friday and especially for adding the link to this amazing piece of abstract flower art, Claudia! Your work is stunning and sophisticated. Love the light. So sorry you missed the link-up period. Hope to see you join in next month. Thanks, Bonnie. I will try and I already marked my calendar. Although ‘selfies’ are not really my thing, we will see. I am kind of surprised that I did. I would have considered myself a “purist” – or something like that – when it comes to nature shots, but I love how the colours all mingle and then break apart. very cool. I have Photoshop on my computer now, but no idea how to use it just yet. You do? That’s great! As I said it certainly isn’t everybody’s style, but I always loved cubist art. Ever since we had to draw in school in that style. PS or PE? Not that it matters too much, PS can be that little bit more overwhelming. You should definitely try and learn it while you have a chance (not being back at work yet). It is a lot of fun, rewarding and you can use it as much or as little as you like. e.g. Most of my photos are pretty minimally processed, just because I shoot raw. But every now and then I get the urge to do more. Like I really, really want to do a composite again. Or like in this case here. Yeah, I know that we all need vacations, time off – absolutely. However, there seems to be a crux with that – at least at times. Thankfully not always – sigh. That’s beautiful, I would frame that and hang it in my downstairs bathroom if I could, it would look amazing in there! You have such talent! You would, Julie?! Hah, maybe I should put it in my shop. Although people on Etsy do not tend to like anything not real or dreamily real very much, if that makes any sense… Thank you so much! I like the photo – it looks almost like jewels – pretty and shiny! I hope, you were able to catch up this weekend and are back in the swing of things. I’m always amazed by how even a short trip can mess up the usual routine and how long it takes to get back on track! 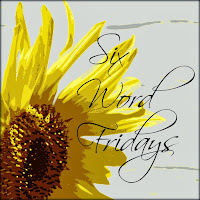 stopping by via the Six Word Fridays links. Although it’s not my usual “thing” I find the abstract flower fascinating, so pushing my limits too. Thanks. Thank you so much, Theresa. It really makes me happy to see someone else taking the time, pushing a little and – reacting, in your case positively, which is even better, but I’d accept any other, too 🙂 Thank you! Nice image. Cubism has such a uniqueness to it. It sure does, it captivated me in my teens and never quite let go. I’ll probably try a few more images.